When observing the smoke plume in the photo, it looks like a classic short pulse explosion normally seen from an ordnance blast with a thin column at its base and is more grey in color. Also, it looks like the plume is still in its infancy stage because it looks like it's still rising straight up and doesn't look at all dissipated by the reported 9 knot wind in the area. 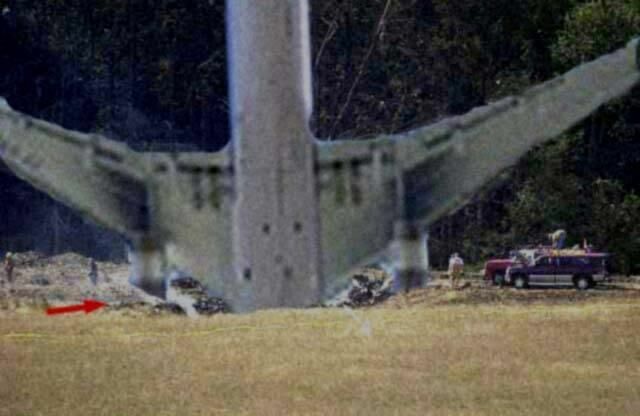 "This cloud picture was taken from a mile away within seconds of the crash. 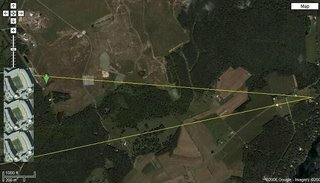 The FBI says that had to be within a couple of seconds because the wind immediately moved the cloud east toward Bedford and all this debris kept falling out it as it went, so they had to send people tracking it -- climbing on rooftops and treetops, through fields..."
The claim of Val's photo being taken approx. 5 seconds after impact seems impossible. Val claims that she was almost knocked off her couch from the explosion, however the soundwave of the explosion would take approx. 8 seconds to reached her house approx. 1.6 miles from the crater (or 8,438ft). 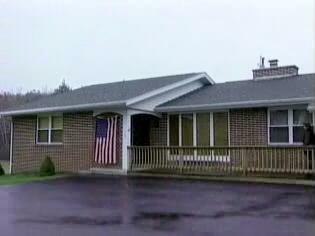 By this account, Val took her photo 3 seconds before the soundwave reached her house! It's also questionable that Val could even have taken a photo in 5 seconds after jumping up off her couch, running to her door, grab her camera, find the button on her camera to turn it on, wait briefly until the camera warms up and is ready to shoot, go out on her porch, and aim her camera to take that perfect shot. 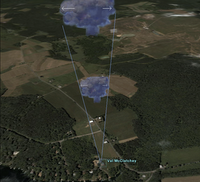 In order for the offical story to be true, the shockwave from the impact that allegedly jolted her on her couch had to reach her house that is 1.6 miles away almost instantly and Val did all the above within 5 seconds. 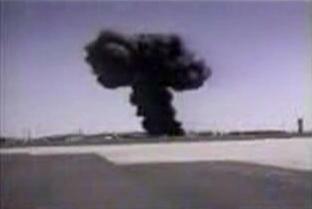 It's very rare that a plane crash makes this kind of plume formation. 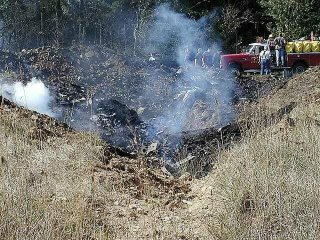 It is unknown how much fuel was on board at impact. 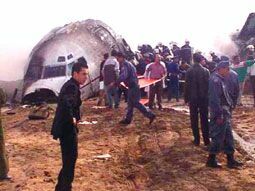 The pilots could have emptied out most/all of the fuel on board as they knew they were about to crash. The photo of this plume looks to be taken within seconds of the crash just like Val's was alleged to since the plume looks like it is still going straight up, it is not that high off the ground, and doesn't look very dissapated (this point will be very important later on in this article). 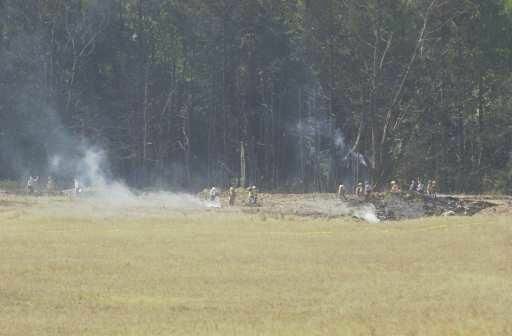 This plane crash left large debris of itself unlike Flight 93's alleged crash. 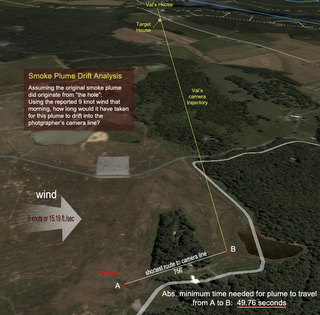 Rumpl4skn then shows that if the plume originated from the crater, it would take approx. 50 seconds to drift approx. 250 yards south into Val's camera direction from the reported 9 knots wind in the area. 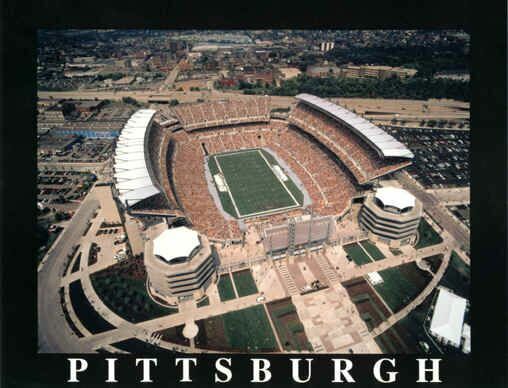 Remember it was approx. 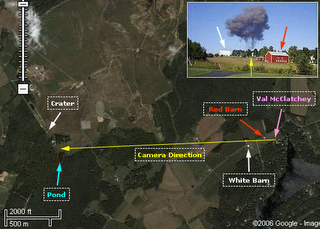 13 seconds from when Val felt the blast and ran out to take her photo. 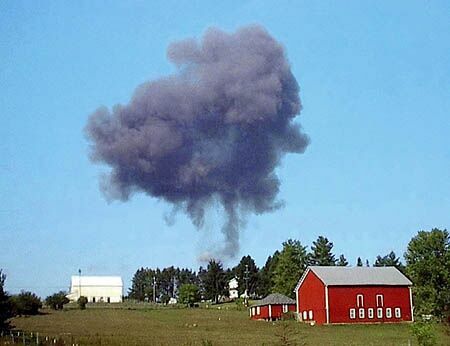 The next batch of comments concerns the issue that - if the smoke cloud was a believable size (which it is not), could it have drifted into position where Val snapped the picture? I.e., could it have originated at the hole, and the prevailing 9 knot wind that morning (Nat. Weather Svc.) blew it into alignment with her camera angle? For background, consider Val's story, in which she details that she took this shot (the only shot she took, btw) within "5 seconds" of hearing the blast, and rushing out her door, camera in hand. 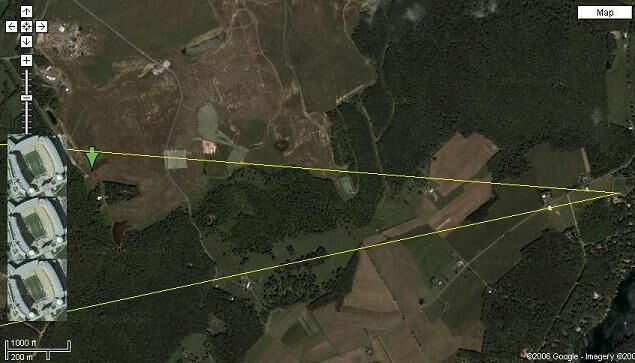 A 756' [252yrd/230m] drift at 15.19 feet/second (9 knots) would have taken closer to 50 seconds to complete. 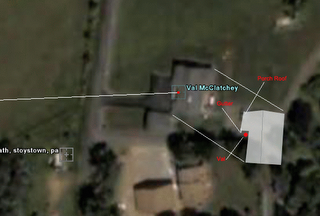 So, this is another problem with either the hole, the cloud, or Val's schtick. 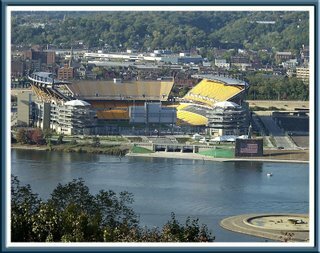 We have shown that the plume in Val's photo could not have originated from the crater if Val really did take her photo "approx. 5" after feeling the blast and for the blast taking approx. 8 to reach Val. 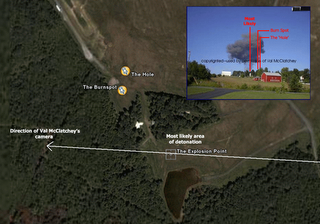 The plume would have originated right next to the pond which is approx 275 yards from the crater. 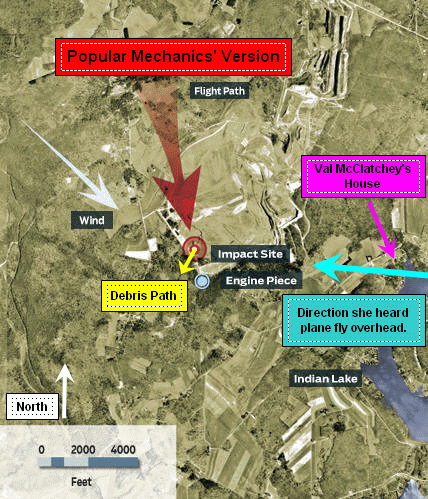 Next we will show you that not only did the plume in Val's photo not originate from the crater, but the plume in her photo is way too big to have even originated by the pond approx. 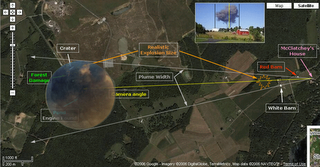 275 yards from the crater and realistically could have only originated just beyond the horizon in her photo. 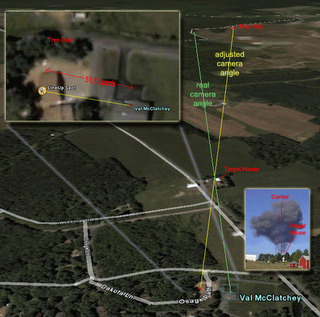 Also note the the crater sits well below the horizon in Val's photo, so the plume would have had to risen that much more before it is even seen over the horizon to be seen from Val's vantage point. 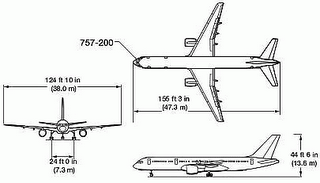 Remember the wingspan of a Boeing 757 is about 125ft wide, not even the length of a football field's 50-yard line which is 150ft long. You've made two mistakes in your analysis. 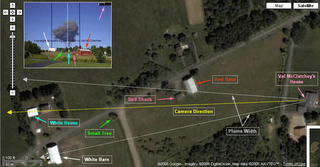 You have it crossing the path of camera trajectory at almost a 90 degree angle. 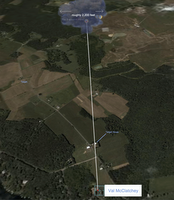 it shows the proper relationship between the direction of the wind and the trajectory of the camera. The two vectors are off by less than 45 degrees. 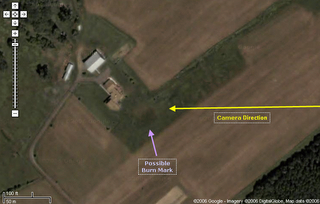 This means that the wind would be blowing the plume more in the direction of the camera than you account for. Your next error has to do with the wind speed. The speed was around 10mph, but that's a ground wind speed. Wind speed increases as altitude increases. That's why they build those windmills on top of large hills and build them as tall as the cost effectively can. 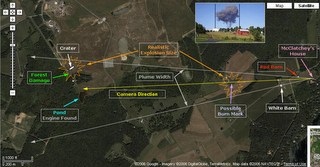 So, as the explosion plume blew upward, the wind speed increased, and therefore blew the plume closer to the camera. That also explains how light debris got into Indian Lake. 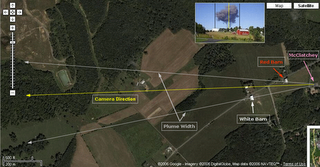 If the wind was blowing the plume more in the direction of her house, then that means the plume must have travelled even further than the minimum 756' in order to reach the camera trajectory. But sticking with the 756' minimum, some simple maths shows that the wind require to move the plume 756' in 13 seconds is 34.4 knots. That's a gale force wind!! So, even when being as generous as possible to the official story, the figures do just not add up. 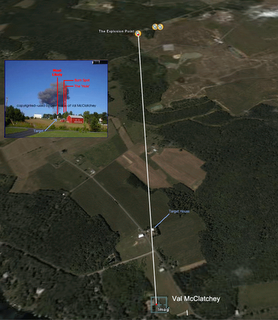 It's hard to believe that plume was from the suggested plane crash at the suggested location. 1. Minimum distance the plume must have moved = 756' = 1/7 mile. 2. Time it took plume to reach move = how long it took photographer to hear the sound + response time = 8 seconds + 5 seconds = 13 seconds = 1/277 hour. 3. 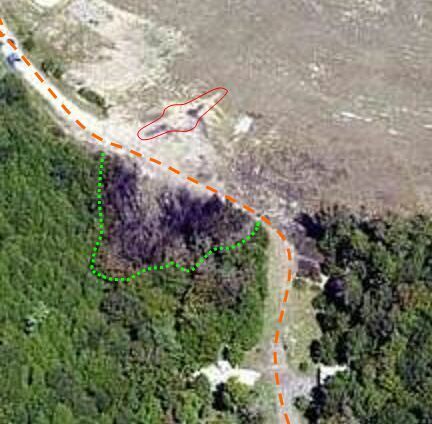 Require movement speed of plume = (1/7) / (1/277) = 39.65 miles/hour = 34.45 knots.